On our nation’s golden jubilee year and to celebrate the 50th year since Tiger Beer released its first can to the world, Tiger Beer has lined up a slew of events and activities to commemorate this milestone in the nation’s history. To uncage the nation from the usual celebrations, Singapore’s Unofficial Official favourite local beer will present a fresh take on how National Day is celebrated, by throwing its own epic National Day party, replete with surprising and remarkably unusual party elements. Truly a party for the people, it puts the power in the hands of the people by getting Singaporeans to vote for what they want to see at their party – the wackier the better. 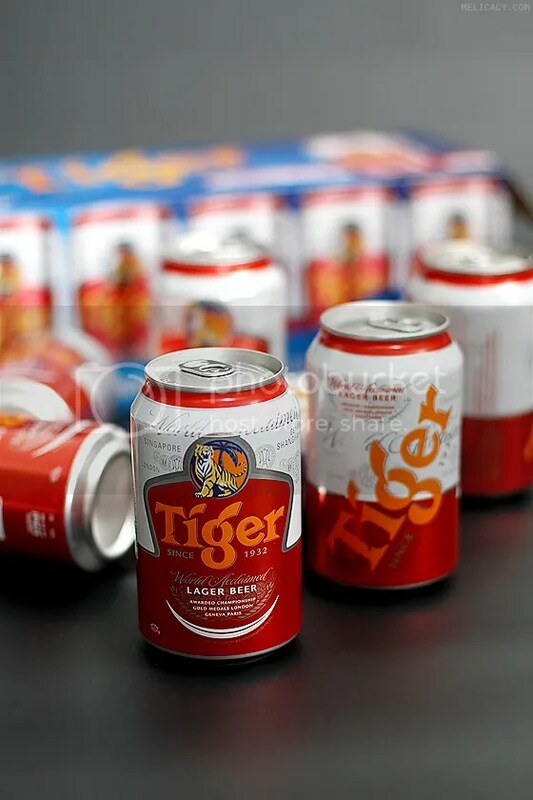 To round off the celebrations, Tiger Beer’s iconic blue and silver packaging will also receive a patriotic SG50 makeover, with the release of limited-edition red and white livery on all its cans, pints and bottles. Be a part of the largest crowd-sourced party of SG50 Tiger Beer will kick off the voting period for the Unofficial Official party of SG50 on 22 June, with the release of a video that will encourage the public to cast their votes to see their favourite party highlights come to life, as well as offer them the intriguing possibility of contributing new suggestions. Eschewing the typical SG50 festivities in favour of something fresh, unique and original, party-goers can look forward to party elements that are recognisably Singaporean and reminiscent of the annual National Day Parade, yet completely unexpected – true to Tiger Beer’s brand philosophy. Imagine a parade flypast done by aerial drones, trishaw massage chairs, beanbags for relaxation that look like giant ‘chope’ tissue packets, or even a chili-crab fountain! The possibilities are endless. Those above the age of 18 can cast their votes at two mobile polling stations located at Knightsbridge on 4 July and One Raffles Place on 9 July, as well as online via the microsite at tigerbeer.com.sg. 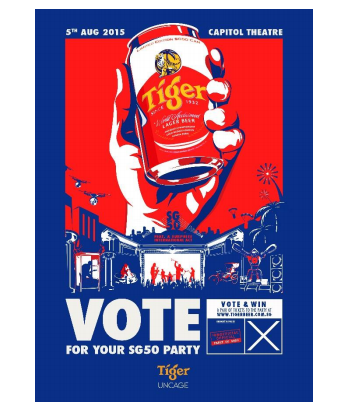 Every vote counts and will directly influence what makes up the party that Tiger Beer will be throwing for Singapore. Tickets to the party cannot be purchased, but only those who participate in the voting process will stand a chance to win tickets to the most coveted party of the year. Some examples of party elements the public can vote on are listed in the appendix. Voting will close on 19 July and those eligible to win tickets will be notified. Party-goers will then see the winning highlights appear at the party. Two international music acts to headline the party. To top this all off, the party will be headlined by two international music acts that will be performing at the party. Audiences can look forward to the catchy party anthems performed by 4-piece indie-rock band, The Griswolds. Hailing from Sydney, Australia, this will be the up-and-coming quartet’s first time performing in Singapore. The climax of the party will come with the appearance of a surprise international music act. The identity of the celebrated British alternative band will be revealed shortly. The party will be held at the newly-refurbished Capitol Theatre, itself a beloved Singapore icon and the grande dame of the city’s cultural heritage, and will be the first event of this scale to be held at the landmark location. Given the Capitol Theatre’s longstanding legacy for entertainment in Singapore, it is the fitting venue of choice. “We’re extremely excited to reward our longtime fans by galvanising the nation to vote for their ideal party situation in the Unofficial Official Party of SG50,” says Mr Rene de Monchy, Head of Marketing, Asia Pacific Breweries Singapore, “Tiger Beer is very proud of its Singapore roots and there’s no better way to celebrate the nation’s 50th birthday than by giving back to everyone, creating a party by the people, for the people – something that has never been done before.” Tiger Beer dons new red & white colours for National Day Inspired by the red and white of our national flag, Tiger Beer will once again shed its iconic blue-and-silver look, in favour of Singapore’s national colours on the livery of all cans, pints and bottles, in a limited edition release to commemorate this jubilee. The 15-can (330ml) take-home packs with the limited-edition red and white SG50 livery will retail at the recommended price of S$35 from 22 June 2015 at all major supermarkets and hypermarkets, whilst stocks last. Additionally, these commemorative packs will come with a collectible SG50 glassware included, available in four different colours. To add to the festivities, consumers who spend $50 on Tiger Beer at participating bars, clubs and restaurants will get a limited edition SG50 Tiger t-shirt. With purchase of the Tiger Beer SG50 commemorative bottles (633ml) at hawker centres and coffee shops, consumers are advised to look out for special crown-liners bearing “$2015” and “SG50” to win $2015 and $50 respectively. Furthermore, collecting 15 crown liners bearing the image of a mug will entitle consumers to an exclusive Tiger SG50 Mug.